How to edit sunrise photos in Lightroom naturally? To have a good camera and photographic skills are often not enough to convey the beauty and magic of sunrise photos. It is necessary to retouch pictures professionally in Photoshop or Adobe Lightroom. How to make it for reliable price or even free? This you can do with free sunrise Lightroom presets that provide various techniques from the best split tone colors to making pastel tones. After applying one of our free Lightroom preset sunrise, your photos will acquire soft colors and low contrast. These are the first settings that are necessary for photos of this genre. Other options become possible due to using Lightroom presets for sunrise and sunset. You can also download the sunrise Lightroom preset with the aim of getting a dramatic look. With their application the entire photo retouching process becomes simple and fast. The presented professional Lightroom presets sunrise suit best for different photos taken outdoors, where natural lightning contributes to their beauty. The same is with landscape and creative images. The only feature is that the best result can be observed on those pictures that are slightly darker and mute in colors. Taking into account such characteristics, a dramatic look is achieved. LR preset #1 "Cool Light"
LR preset #2 "Dark Matte"
LR preset #3 "Sunny Day"
LR preset #6 "Soft HDR"
LR preset #7 "Warm Green"
LR preset #8 "White Balance"
LR preset #10 "Warm Tonning"
All free sunrise Lightroom presets have been carefully created and thoroughly developed with the goal of adding a special sunlit glow, underlining natural beauty and getting a creative edge for pictures. Lightroom presets sunrise have been designed in such a way that any outdoor photography will look professionally improved. Each Lightroom sunrise preset is hand designed. For many photographers Lightroom presets for sunrise and sunset have become an indispensible part of retouching outdoor images. In some cases they even may substitute the whole process. That makes the work faster and the number of customers bigger. 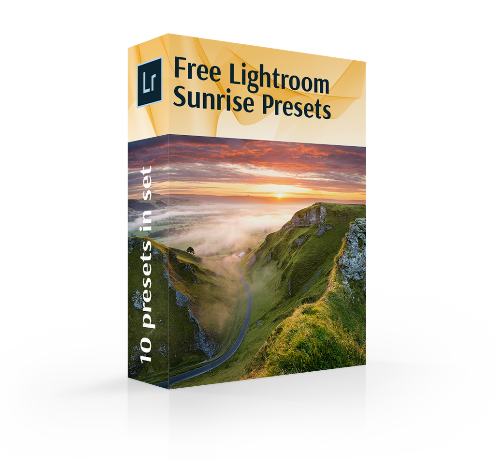 Free sunrise Lightroom presets enhance landscape photos with a considerable burst of tones paying special attention to sun colors. The common problem of photos of this type is that pictures turn out to be a little white and hazy. This difficulty is also can be solved after applying at least one sunrise Lightroom preset. They flatter photo colors making them natural and attractive. In case you are interested in Lightroom presets for sunrise and sunset, our team presents a number of their best samples. Adobe Lr Preset Free #1 "Cool Light"
Cool effect can be added only with one click leaving behind all difficulties concerning this retouching operation. With free Lightroom preset sunrise photos of nature will shine. Enhancement will be completed with adding necessary colors and improving contrast, degree of which can be regulated by you for the most attractive result. Lightroom Sunrise Preset #2 "Dark Matte"
The sunrise Lightroom preset professionally adds brightness and strongly emphasizes bright green and all yellow tones. It is used by modern retouchers mainly to improve beach photos. The plugin is not recommended for retouching portraits, because it may give an unpleasant unnatural look to the person`s skin. Landscape photography will only benefit from it. Sunrise Preset Lightroom #3 "Sunny Day"
The next efficient free Lightroom preset sunrise has the next algorism of retouching actions. It saturates colors. The filter can be used for both ordinary portraiture and nature pictures. With the last genre the outcomes will look more professional as on the example below. Free Lightroom Preset Sunrise #4 "Darken"
This Lightroom sunrise preset has a definite specialty in applying. It works well on those photos that have dark or even purely dark backdrop. On photos with such characteristics retouching techniques will benefit in the most visible way. The plugin is completely combinable with travel, street, fashion, landscape types of images. Sunrise Lightoom Preset #5 "Vibrance"
If you use these Lightroom presets sunrise, your photos get warmer colors – not dramatic. Retouchers or photographers choose them in case they want to get photo post processing with emphasize on color correction. The plugin is especially effective in tone saturation. The result of it is visible, but natural. Because of described peculiarities sunrise Lightroom preset suit for retouching of landscapes. Lr Sunrise Preset #6 "Soft HDR"
This Soft HDR Lightroom sunrise preset is focused on adding High Dynamic Range effect to photos of nature and landscapes. The filter is frequently chosen, but experienced retouchers are sure that it works with pictures that are rich in small details and varied textures the most successfully. This plugin is strong concerning provided effect, especially on photo edges. Retouchers always adjust its settings up to their needs. Sunrise Preset Lr #7 "Warm Green"
The filter has a number of provided areas that have turned into its pluses. In case a retoucher chooses the free Lightroom preset sunrise, the outcome will have slight wash effect and high contrast. It also has a strong influence on coloring. A picture will acquire saturated red, washed green, mild purple and medium grain colors. Sunrise Preset Lr Free #8 "White Balance"
After using this filter you will notice how all photo colors have been changed. Such Lightroom presets sunrise are suitable for the images with abundant light. These are photos made during a sunny day - a landscape with a blue sky that has no clouds. In case a photographer captured direct sunlight, the plugin will be useful. Lr Sunrise Preset Free #9 "Bright"
This filter guarantees the photo edges been darkened as with vignette effect. It helps to make a focus on the photo center. In some case this Lightroom sunrise preset adds a final touch to pictures that require it and gives emphasize to small, but important details. Adobe Lr Preset #10 "Warm Tonning"
The last plugin should be used for landscape or even wedding photography. This sunrise Lightroom preset is characterized as soft and slick. It adds warm and pastel tones and a slight hint of grain. Every Lightroom sunrise preset has one common feature which is being designed by professional retouchers. Those specialists before creating them took into account all important peculiarities of nature sunrise photography. This fact makes free sunrise Lightroom presets suitable for all types of landscape pictures.